Following in the path of some great bloggers, it seems I've broken my toe. And, on the back of Sister's foot. Basically, I ran right into her heel and broke my 4th toe. The one closest to my pinky toe. I had a doctor friend look at it and he gave me the basic ice, elevate, wrap and ibuprofen advice I'd probably get from my doctor so that's what I'm going to do. Can I tell you how silly I feel doing this on the back of my daughter's foot? I received this from my husband this morning. 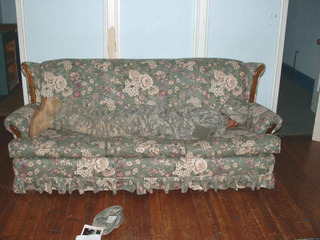 ETA: Ben wanted me to add that this is not my him, it's a picture he received from one of his soldiers.